eCite - Are streamside buffers edge-affected habitat for ground-dwelling forest beetle assemblages? Are streamside buffers edge-affected habitat for ground-dwelling forest beetle assemblages? Reservation of forest in riparian buffers is common practice in commercial forestry areas worldwide, potentially providing valuable habitat for biodiversity dependent on mature forest. However, the habitat value of narrow reserve corridors can be compromised by edge effects. We investigated the habitat value of streamside buffers in wet eucalypt forest for ground-dwelling beetles in Tasmania, Australia. 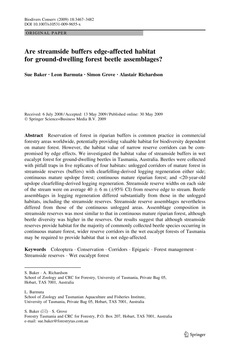 Beetles were collected with pitfall traps in five replicates of four habitats: unlogged corridors of mature forest in streamside reserves (buffers) with clearfelling-derived logging regeneration either side; continuous mature upslope forest; continuous mature riparian forest; and <20-year-old upslope clearfelling-derived logging regeneration. Streamside reserve widths on each side of the stream were on average 40 ± 6 m (±95% CI) from reserve edge to stream. Beetle assemblages in logging regeneration differed substantially from those in the unlogged habitats, including the streamside reserves. Streamside reserve assemblages nevertheless differed from those of the continuous unlogged areas. Assemblage composition in streamside reserves was most similar to that in continuous mature riparian forest, although beetle diversity was higher in the reserves. Our results suggest that although streamside reserves provide habitat for the majority of commonly collected beetle species occurring in continuous mature forest, wider reserve corridors in the wet eucalypt forests of Tasmania may be required to provide habitat that is not edge-affected.